My Halloween costume the last five years has been some variation of businesswoman drag, that is, I would wear an outfit that was appropriate womenswear for an office setting. I chose that costume because I went to work dressed as a woman the last five Halloweens. Now that I am retired, I no longer have an office to go to. 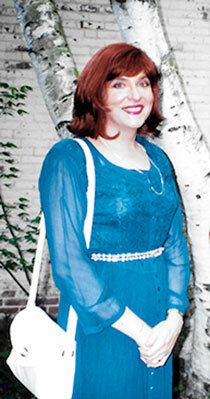 But I plan to do businesswoman drag again this year and spend the day out among the civilians as a woman. I plan to visit places where I usually do business as a guy, for example, my bank, my hairdresser, my gas station. I also plan to go shopping at a mall or two. Doing businesswoman drag on Halloween is a safe way to go out among the civilians en femme. I may pass some of the time, but when I don't pass, I don't have to worry about a negative reaction because it is Halloween and I am just wearing a costume. 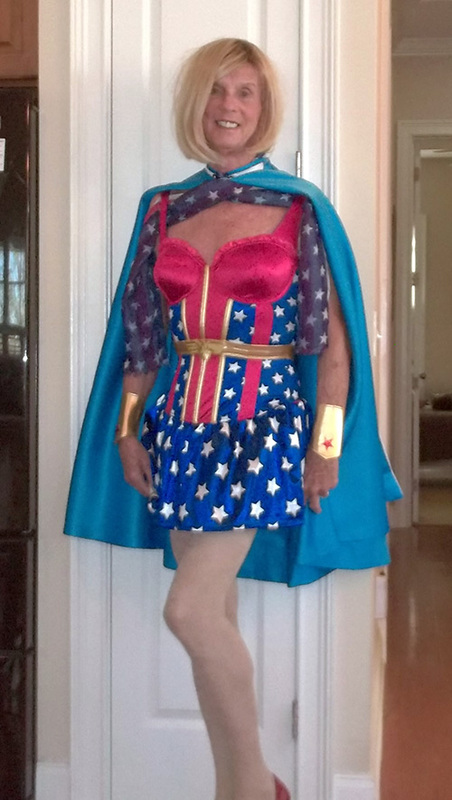 Some transwomen eschew going out en femme on Halloween for one reason or another. Each to her own. I have had a blast every year I have done it and I am counting on having a good time again this year. By the way, send me your Halloween costume photo and I will feature it in the Femulator spot below, just as I did today with Marie Anne's costume photo. The big factor for me is meeting the employer dress code. I don't want to be sent home to change. Therefore I have to be fairly conservative. My businesswomen costumes always met my company's dress code. I like the concept. I will see if I can come close to making it work for me. Have fun whatever you do, Pat! Stana, I thought you might visit your former employer site on Halloween? Thanks for the heads-up. I inadvertently left that off my itinerary. 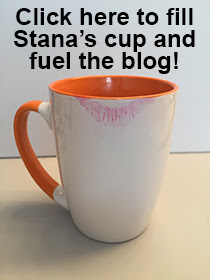 Stana, I'm a big fan, so I hope you will take this comment in the positive spirit I mean it. To me, it's not a costume if one dresses as they would every day. To wear everyday clothes and say it is a costume is demeaning to one's own femininity. To paraphrase Diane von Furstenberg and you - Feel Like a Woman, Wear a Woman's Costume on Halloween. Hugs. Like I said, "each to her own." I went out Sunday dressed in a yellow jacket dress, white heels and a new wig. Full makeup and all. I went to a party store cause I needed to finish my flapper costume with jewelry and fish net stockings. Anyway, I asked for and received help from the staff and checking out revealed myself by saying I was preparing fore a dress as your boss contest on Monday. When leaving I heard another costumer in line say "I would never have known if I did not hear the voice." What a nice interaction and compliment.